Q: "I see that your description under Rear Transport Covers states WaterProof and Water Resistant Material. Is the cover completely Water Proof?" A: "No. The covers are not completely water proof. They will resist and stay dry if it is a light rain but if you are traveling in a rain storm......the materials will eventually soak through and drain into the cover. The zipper as well will seep as it is not waterproof. We have grommets on the bottom of the covers to allow the rain to drain out and when you arrive to your destination please remove the cover and dry your bikes off. The cover is intended to keep the bikes clean and it will help keep them dry but if you definately need water proof we would not reccomend use." Q: "I’m not sure what size cover to buy. I have 2 medium frame mountain bikes with 29” wheels on a Kuat 2-bike tray-style rack." Because you have a tray style rack you will need to upsize to the RTC200. This cover will be on the bigger side for 2 bikes and you will have excess material which can be cinched down with the straps attached to the cover. Just watch so that you don't have flapping of material which can cause a hole." Q: " I have a Yakima Dr Tray, tray style rear rack. What is your recommendation regarding size of the cover. I have two Raliegh Venture 4.0 street bikes (not Fat Bikes). I have a wired trailer hitch on my SUV so I plan on purchasing a cover with the light kit." For two bikes on a Yakima Tray rack you will need our RCTL200 (the L signifies) with lights. You will have plenty of room as usually our RTC200 will hold up to 4 bikes but with a tray rack you need to use some of that room (volume). It comes with built in straps that you will want to secure the cover (any excess material) to keep it from flapping while traveling. Check periodically and adjust if you find signs of flapping. Excess flapping will cause wear or holes in the material." Q: "I’m interested in trying a Concept front end on my XM this upcoming year. I’ve had some so-so past experiences with Float shocks and would like to consider trying a set of coils up front again." A: What are the bad experiences you have had with Float shocks? Was it a float 2 or an R Evol? When we started prototyping and testing front end geometry three years ago we were set against using a Fox Air shock, even though we came from the mountian biking industry where Fox is dominant. The coil seemed to have a much better feel for what we were doing as well as being dependable, and so when we started working with Fox they actually built us prototype coil shocks. But along with that they convinced us to try the Float R evol and the X evol side by side with the coils to see what we thought. All we had ridden at the time were Float 2 shocks and I thought they were terrible. To get them to handle aggressive riding you had to set them so stiff that they wouldn’t move half of the time and to get them to be supple and active you couldn’t maintain ride height and the sled would dive and be sporadic. Bottom line is that after a year and a half of testing, the result was that the R evol is an amazing shock that out performs any coil I have ever ridden. The closest progressive rate spring design is a triple rate and its three times the weight and complexity, but still not nearly as smooth and unlimited at the bottom end. Three years ago we were new to shock tuning, and now I have a whole new outlook on how shocks work. It comes down to how a shock is set up, and a Fox shock sold on a Yamaha is tuned by Yamaha, and a Fox shock sold by Arctic Cat is tuned by Cat. The OEMs will take parts out of them to reduce cost which has a negative effect on performance. They tune them for entry level riders and moderate terrain at lower speeds. The shocks we sell are tuned by us and handle the technical terrain riding and the aggressive trail riding that we require. But also have all the components like the negative spring and Kashima that make the shocks feel awesome on any surface at any speed. We sell the Fox shocks because they are the best shock we have ever used. They are plush and active (especially with Kashima), incredibly tunable and have a bottomless feel that will handle the most aggressive riding style. A lot of our customers have tried the floats before and the response we get from people who ride the R evol kashima are positive. Just talked to a guy last week that came off of exit shocks and had the same response. With the right valving its unbeatable. Best part is we can help set them up to get the most out of the plus forward front end, which includes eliminating the sway bar. been tested yet with the new XM? If so what has the feed back been. benefit to the already great handling 2013 XM." riding the t-motion is that it doesn’t improve the handling that much). end on that all became possible. the rider to have more input. Q: "I'm interested in the 36" concept a-arms for the ski-doo xp. I was just wondering what changes were made to the front end geometry. I was wondering if the caster is changed and if the skis are moved forward similar to the nitro a-arms, and what the advantages were to the changes. Thank you and love your products!" A: The ski doo a arms are plus forward much like the nytro, but the dimensions are a bit different to fit the skidoo chassis. The spindle is moved about 3" forward from the stock location which is set off of the position of the rider and the steering post. Beyond the spindle movement we did adjust caster which helps with the steering effort and the predictability in a turn. It keeps the ski flatter in a side hill which also makes the feel more predictable. But the important handling changes created by the front end occur because of the plus forward geometry. By moving the spindles forward we are affecting the weight transfer making the front end feel lighter which makes everything more maneuverable. It also makes the sled easier to side hill and downhill turn. In low snow conditions it makes off camber situations way better and just changes the feel of the sled. We were just testing in Wyoming and we had stock sleds setup to compare and it's amazing how different they are. Something that you can even feel on the trail. Q: "Hello. I bought new Skinz a-arms for my Yamaha Nytro last year. I was wondering if you have any special set up you can recommend for me. I ride a yamaha nytro with the mcx 270 hp turbo kit. I have a timbersled back suspension 162 long with the fox float x shocks. And in the front suspension I have fox float x. In the front suspension I use 75 psi in the shocks. In the timbersled back suspension I use the setup from timbersled for sleds with 290 hp, this setup makes the sled good to climb with, but makes it very hard and bad for trail riding and sidehilling. I want a sled that handles good in the woods and sidehilling, I know you have tried many options on your nytro black with timbersled suspensjon and 4,5 forward a-arms to improve the handling. So some suspension setup for my sled would be nice. " A: I'm glad you asked because there are a few things that we can do that will make a huge difference. One very important idea is that the setup for climbing and technical terrain are very different. So we can not have the best of both worlds, the better the setup for one the worst for the other. It comes down to understanding weight transfer, when you are climbing you want more coupling of the rear suspension and more weight at the front suspension. That way it keeps the sled from tipping over. For technical terrain riding you want the opposite. An uncoupled rear suspension and less ski pressure. That will help with side hill maneuvers and a general light weight feel. Rule of thumb is that the rear suspension should be set up as soft as possible and the front should be set up firm. This increases the ride height in the front and decreases it in the rear end which encourages transfer to the back of the sled. When the sled feels light, you will feel more capable on it. I wouldn't worry about the sled track standing for now, I didn't have that problem on my nytro when it was boosted and so I doubt you will. Here were my pressures roughly and keep in mind I am 200 pounds and 6'2". Rear, 60 center and 85 rear. If you have evol in the rear run it at about 185. The ski shocks should be set at about 85-95 and 175-205 in the evol. One other thing you can do in the rear suspension is adjust the ride height. Because its a Timbersled you can install the aluminum spacers on the top of the coupling slide. I would install the wide spacer, one on each side and remove them on the coupling side or the bottom. For now you do not want any coupling. Q: "I have a 2009 Nytro and I am considering making some changes to the sled after reviewing your products and watching the "Black" videos. (very impressive) However I do have an inquiry about the handling and performance of the Nytro after the changes compared to a stock 800 PRO just for example. It is a big commitment to throw thousands of dollars towards new Skinz equipment for the Nytro in hopes of better handling (new A-arms, suspension skid, track, under tunnel exhaust, steering etc). I would like your opinion on if you feel it is worth investing in this Nytro or just go and get the PRO 800 that will handle well right out of the box? Will the changes made to the sled turn it into a comparable mountain sled to the PRO? My riding style is not super aggressive and I am not a true hill climber. I just want something that is easier to manoeuvre and capable in the mountains for side hilling, turn ups, etc and not get thrown off like it is now! Any input towards my inquiry is greatly appreciated." A: There is nothing as good as the Pro RMK right now. But, the reality is, the Pro does not have anywhere near the kind of durability and dependability as the Nytro. We have a strong preference to the Nytro and what it is capable of once it is in the “Black” form. If you are a Burandt style and capable rider, you would probably want a Pro but then he gets new machines each year for free and that’s not a reality for most of us. The Nytro has capabilities and benefits the Pro or the other brands will never have. In the Black form, it is very nearly capable like a pro but it does require a little more effort. It is able to have power added like a supercharger or a turbo which would not destroy the motor if you stay in the 180-200 range. It can climb with anything with the new setup and it will side hill at will and do all the negative or off camber uphill turns you want to do. It is not a disposable sled like the Pro. The fact is, the Pro is not that durable and it is really in the 145 hp range for power. If your Nytro is stock, it will buck you all day long. If you watched the movie, you saw this very thing happen. The new changes take that away and make it predictable and pleasant to ride. You will have control over the machine instead of the machine controlling you. It is a tough decision because it really depends on your own personal situation and the type of riding you do. With your comment about the type of riding style you have, I would say the snowmobile in the Black form would be more capable than you are. It will allow you to push yourself if you wanted to and give you a great feeling about the ride. You won’t have that miserable feeling anymore about rolling over a hill or an off camber scenario. It won’t want to dart to the left or right or dive like it does now. It would really be like getting a brand new machine. It’s a decision of getting a very capable Pro or getting a very capable Nytro. When you see what Chris Brown is doing on a Nytro, it would be easy to see what is possible with this machine. I attached a pic for you of Chris. This machine has our front end, bumpers, running boards, and seat kit. Your machine in a Black form would have more than his. You can’t make the wrong choice here even if it is a hard one. You are going to be happy with both machines. The Nytro is going to last a lot longer as it is a very high quality machine and it’s epic as a Black. We want to see you get the right machine for you, your family, and your situation. You can take this info and use it to help you make the right choice. Q: "How can I tell if I have Spherical Bearings in my shocks or not?" A: All after market shocks from Fox are built with spherical mounting bushings. Oem fox shocks are not. The best way to tell if it is a spherical bearing is to look at the busings that the bolt will go through. If they are metal then it is a spherical. If they are plastic and black then it is a through bushing and not spherical. Q: " How long does it take to install the front end?" A: I would give myself 4-5 hours for the install. It's easy but time consuming if you are thorough. The instructions are really good. Most people ask about setting tow and camber....you will want to read what the instructions say about it because it's really good. Q: "I am about 175 lbs and I am not a big hill climber (although I enjoy it) but I'm really interested in trees and technical riding. What shock pressure should I have in Skiis-Center-Rear?" A: There are no set rules for shock settings but I will give you some to get you started and then you can adjust from there. The general rule of thumb for technical terrain riding is as soft as possible in the rear and as firm as possible in the front. The main chamber primarily sets ride height and so you will want to maximize the ride height in the front and minimize the ride height in the rear. You should be running the Timbersled skid completely uncoupled assuming that you primarily do technical terrain riding. If you have trouble with transfer we can go to some different settings, but I wouldn't worry about that for now. I ran a 180 hp supercharger and never had that issue running fully uncoupled. One thing I recommend that you do with the Timbersled rear is to add the aluminum spacers to the top of the coupling slide to lower the ride height in the back. To fine tune the pressure in the rear suspension, compress the suspension a few times and let it come back naturally. Then sit in your normal riding position and measure the height drop at the rear bumper. It should be about two inches. If it is less than that-take some air out of the rear shock. You want to run the suspension as soft as you can without bottoming it out (to start) - You can always go stiffer until you are happy with the way it feels. If the sled is swapping or kicking then you have too much pre-load in the center shock and you will want to remove some air. A soft active rear suspension will compress and adjust to snow conditions keeping you on top instead of trenching. The front is trickier to tune. You want the front to be firm enough that when you get on the sled it doesn't sag more than about 1/2", but you can't go solely off of that. I can tell if it's right by rocking the sled from side to side. I'm looking for the perfect balance between a predictably firm feel and a soft active feel. The best way to tell is on the trail so here is what to look for. If you are going down the trail and it feels choppy and firm, take out of the evol chamber. If the shock isn't moving through it's travel, take out of the main. If it feels aggressive and "grabby" then you need more air in the main and if you feel like the shock is hitting hard on the bigger hits or it is not holding the sled in a side hill then it's usually not enough in the evol. Center Shock: One common misconception ......transfering more weight to the center shock by pre-loading the shock in an effort to unload the front end will cause handling problems. That's a really general run through of shock setup and it's going to get you about 75% there. Q: "Why does my steering feel heavy?" A: It comes down to weight transfer. If you transfer more weight to the rear suspension than your front end will be lighter feeling. If you transfer more weight to the front suspension than you will feel more weight at the skiis (feeling heavy). shocks as firm as possible and the rear suspension as soft as possible. should drop about 2", so change the air pressure to allow that to occur. swapping, then take air out of the center shock. practical because you cant stop and adjust things that often while riding. We have a new product coming out this summer that you will see really soon. about how to tune that as well, but we have to wait until the release. Q: "I just have purchased a 2012 Nytro MTX 162 and I have not received it yet, so I went to ride my friends 2008 turbo hill climber, so needless to say I was devastated the way it handled and was wondering if the 42 inch A arms would fit the MTX I know they are for the RTX XTX models but I want my wife to drive this sled so I need to go as wide as possible, I could not control the nytro in stock form that I rode, hard rear, soft front for hill climbing, ask the guys what kind of skis they would recommend for our sled, lakes, deep snow fields and rough trail, need it to not tip over and handle like on rails." The Nytro handling issues are complex to say the least, and so there are a couple things to understand about getting it setup the way you want it. First off, yes the 42” a-arms will fit and they will be stable but I don’t think its really want your going to want. The “mountain climbing” setup that you referred to is also part of the problem. You cant setup a sled worse than having a soft front and a stiff rear (that goes for any sled), and on a Nytro its even more catastrophic to the handling. It transfers excessive amounts of weight to the skis and causes an erratic and very unpredictable feel. In fact the sled needs to be setup exactly opposite with a proper spring rate in the front to hold the right height (ie stiff) and a soft active rear suspension setup that will move with the terrain instead of trenching and sawing through the snow. This sets a proper balance between the front and the back allowing the riding to control direction instead of the sled. By using our front end it fixes the geometry issues but it needs to be combined with proper suspension setup. Kind of like diet and exercise go hand in hand. The Concept 39” front end on the Nytro MTX with a good setup is amazing on and off trail. All of the off camber roll over and diving tendencies that Im sure you felt will go away completely. Its stable, predictable and easy to handle, which means safe and confidence building for your wife. So Im strongly recommending that you do not use the 42” wide on your sled because ski width was never the problem in the first place. The skis can contribute to the problems depending on which ski you use, we recommend a OEM polaris RMK ski, Simmons gen 2, or SLP powder pros. There are more donts than do’s when it comes to skis. Q:I`m considering buying a 38” Concept front suspension to my Nytro that has stock shocks from Öhlins (Swedish TTX edition) with springs, these are very nice shocks so I`d like to use them but cant find out in the faq what the largest possible spring diameter is for the upper A-arm. Can you help out so I can verify this before I order? A: We are happy to help you confirm the fitment. In fact, we work very closely with Ohlins and now offer the TTX shock for most of our concept kits. The TTX will work very well with our Nytro kit, and you won't have any issues with the spring diameter. We have run many different shocks on the Nytro and never have had a spring clearance issue. We don't have a specific diameter measurement unfortunately, but our TTX is a 30mm bore shock and the spring that Ohlins uses with it is not too large. We don't offer an actual 38" kit, the YNAA600 is a 39" and the YNAA605 is a 37". Just to confirm we are talking about the YNAA600 which can be set to 38" by offsetting the skis in on the spindle. I have an arctic cat hcr m800 2013 with the 42" front. But after one day of tree rideing I am exhausted, so i have started to consider if i would by an a-arms kit from skinz 37". how long shall the shock absorber be? suits those who are already sitting on the my hcr (42")? or do i have to buy new shocks to?" The oem shocks on your sled wont work for a couple different reasons, first they are too long (the narrow kit was designed for a 17” shock), they don’t have the spherical bearings in them and they are not valved for a narrow front end. The shocks that we sell are designed for our front end, not only for physical fitment but also for handling performance. We believe that in order to get the most out of a suspension design it has to be tuned as a complete system. All shocks are not alike, and the Fox shocks that come OEM are cost down shocks with a very general valve spec (even the evols that come on the HCR). You are on the right track with wanting to narrow the front end, changing the ski stance will give you a huge amount of rider input, especially in technical terrain. We have been testing the handing of the proclimb chassis since it came out in 2012 and there are a few things on top of ski stance that we are able to address with the front end. If you only narrowed the stance, the sled would roll over easier but the rider effort would be just as high. The oem geometry was designed more for large bumps and jumping than technical terrain and off trail riding. Moving the spindle forward, changing caster, increasing ride height of the front and decreasing the height of the spindle translates into a very stable and predictable front end in all situations. The sidehill stability and technical maneuvers like down hill turns become intuitive and easy to control, which means less energy to ride. If you feel like you are fighting the sled then its most likely more than just ski width, it’s the handling characteristics as well. I have a question about the a-arm kits for the Proclimb m1100 turbo. Will the fox float 2's work with the a-arms and also does the boost tube get in the way of the a-arm. Cause my understanding is the a-arms move ahead 3 inches and am wondering if there is enough room for clearance." A: The stock float 2 shocks will not work because they need the spherical bearings in them. The shock that we offer with the front end is also a different valve spec to improve the handling with our front end. There is no clearance issue with the turbo tube, the forward movement is 3" but the upper mounts in the oem locations and works with all models. Q: "Hello I have a 2013 Polaris IQ Racer that I have the Fox Float X Evol front shocks on. Is there an A Arm package that you sell that will work with this application??? A: I'm not sure if our front end will fit the race chassis or not. What we make was designed for the Pro chassis and fits the rush and RMK models. I looked it up on the micro fiche and the mounting looks different but the arm has some similarities, I would need to actually fit one to know for sure so at this point im going to say no. Q: "What is the difference between the 38" and the 37" A-Arm and which is better?" A: "Both front ends work awesome. There are some things they have in common and there are also a couple of differences besides just the width. The construction of both arms is the same. They have the Frame Series Aluminum uppers and the 4130 Chromolly lowers. Both come with new billet aluminum spindles and both have the geometry that moves the spindles forward. One of the major differences is the shock length that we use. The 38" won't work with the stock shock (need spherical bearings and different spring rates) but it does use the stock lenth. The 37" front end uses a longer shock which gives the front end more ride height and more travel (the 37" is only sold with shocks.) More ride height also helps the sled handle better, making the front end feel lighter but also giving the rider more input through the steering. People usually pick the front end based on riding style. The 38" arms are great for more open terrain and for someone who rides a little more trail. The 37" is designed for the tighter and more technical terrain, steeper side hills and bigger bumps. A lot of the Pro Polaris riders run the 37" a-arms like Chris Burandt, Dan Adams and others." Q: "Are these the same product? The BPSFE240 says it takes a 16.7" shock. OEM length. The PAA225 is more confusing about shock length." Which one fits a 2017 Axys best, in keeping with the OEM shock length? A: "The front end options are fairly confusing but I can help break it down. All of our Polaris front ends that accept the factory 16.7” length shock also will work with shocks that are up to 17”. There are four different front suspensions that will work with the length shock you have, but only two will work with the actual factory shock (it sounds like you might have a Fox shock or something aftermarket). All of our front ends are great but each one is for a different purpose. I am listing them in order of skill level since most people buy our suspensions to improve the handling and capabilities of the sled (in order from beginner to advanced). All of ours do this but to different degrees and with different parts included in the kit. We could talk for hours about the differences of each front end. If you want to know more about any specifics let me know, but this is a general run description. The Free Flow is now the most popular and best for all around technical terrain riding. The Burandt Extreme is best for really aggressive terrain and free-riding. The Concept kit is going to help slow the sharp edginess of the Axys, making the ride more predictable. And the 36” kit is very comparable to REACT, but mostly just narrowing the stance." Q: "I`m wondering about buying a seat kit for my Nytro 2010mod. But I want my seat to be higher than stock, Is your seat higher than stock? How mutch if it is higher?" A: The YNSK600 and theYNSK600Ut– Nytro seats are 2”taller than stock. If you need to mount an oem style exhaust to the seat frame then you’ll want the YNSK600, but if you are running an aftermarket exhaust and don’t need the mounting then you can get the YNSK600UT which doesn’t have a bracket welded to the frame. That’s the only difference between the two. Besides being taller than stock, they are cut narrower to allow more freedom of movement and are lighter than stock. Q: "With some mild mods, can I put your 04-07 rev seat on a 121 tunnel?" It might not need any modification to fit, but it is really hard for us to know. Many times our older applications are incomplete because the sleds were just not available to check fitments. We typically write the application for the ones we know 100% and then do our best to advise people on the rest. The tank design is the most critical part. If the tank on the 121 is the same on the Rev Summits then chances are it will be the same. Many of the summit tunnels were identical to the back of the seat, and then just extended out. I’m not sure which 121 you have but it would be a place to start so you know if it needs to be modified." Q: "How hard are the seat wraps are to install?" A: Most seat wrap installations just take patience and a pneumatic stapler. An electric stapler (with a 3/8” wide or 1/2”) will work but the pneumatic is more powerful and sets the staple in better. There are a couple wraps that slip on but most take staples. You can look at the OEM seat to determine which one you have. Whenever we install wraps at Skinz we start with two staples in the front center and two in the back. Then, we work the left/right sides middle to front. Starting at the back and front helps center the wrap so you don’t have to worry as much about getting it off center. You may have to reset once in a while by pulling out the staples and re-centering! It’s a patience builder!! I own a 2008 Yamaha nytro mtx 153 and am looking to strengthen the rear of the tunnel as it seems to be fairly weak. I was wondering if this was the purpose of your tunnel kit, also what is the extension piece meant to do? and can I run my bumper with a hitch. The purpose of the tunnel kit is to update the rear part of the tunnel. In the kit you get three things, a bumper, a rear tunnel cap (extension piece) and running board braces. A lot of snow hangs up on that tunnel because of the depth of the tunnel and the length of the running board. The new rear bumper allows you to cut the running board and tunnel to remove some of that drag in the snow. The new rear cap has a 1” deep flange on the back to mount the snow flap to, instead of the stock one that is almost 5” deep. The rear cap is also what allows you to add length to your tunnel by sliding it back to a desired length before installing. This is an optional part of the install and so you don’t have to use this piece to extend the length of your tunnel. Because when installing, you cut a portion of the running board off, you then install the running board braces that are included, this adds a lot of strength back to the tunnel. The bumper that is included is much longer than stock and covers more of the side of the tunnel, so it adds a lot of strength. This kit is made to be flexible, you can install it a number of ways. If you want maximum strength, then you can minimize the cutting and install the new parts to add as much strength as possible. The rear bumper alone will add a lot of strength to the tunnel, but im not sure how it will work with a tow hitch. Yamaha makes a tow bumper for your sled, but its as short as the stock one so it doesn’t add much strength to the tunnel. I would recommend looking at the tow bumper Yamaha makes for the 2011-2014 Nytro MTX Se. It’s a much longer bumper, and it might require a little tweaking but it would add strength. Q: "I have a 2008 Arctic Cat M1000 153 was looking for the running boards for this sled, however your ad says I need a tunnel kit? What is this and what is the cost?" A: Our running boards eliminate the whole oem running board and on the older M chassis sleds that running board goes to the back of the sled. Because removing the running board all the way to the back will weaken the tunnel, you need a new rear bumper setup. Our tunnel kit eliminates the running board behind the rear suspension bracket and comes with a new stronger bumper to put the strength back in the tunnel. It also comes with a new snow flap and tail light bracket to update the design of the back end. Isn't this awesome concept supposed to limit travel and prevent skilift..? No matter the setting I have at the handlebars, the difference is unnoticable. I would wish for a much firmer high-setting, just as if it would be coupled the old fashioned way. One can see, flat on the garage floor when my GF swings her 120 lbs on my Freeride, that the shock would compress some even with the highest setting. Is it possible to have the shock revalved, for at FIRM, fully coupled firm setting and a fully uncoupled loose setting? That is exactly what I'm looking for, and hoped from the ARC - coupled or un-coupled. Just like if I would install/remove a coupling block." A: I think I can help shed some light on how ARC is designed to work, and how although this product does in fact “dynamically” couple the suspension, it makes traditional coupling outdated. ARC was designed to control the front end and minimize ski lift on the machine but we don’t want it to lock out. Fully coupled skids actually perform worse than ARC in almost every situation. Because a coupled skid is over compensating for load you have less track on the ground and the suspension becomes less compliant than the snow underneath it and therefore causes trenching and other negative handling characteristics. ARC performs more like traction control because it is allowed to give and move with the suspension. Almost every Pro rider out there runs a boosted sled and almost every one of them now uses ARC. Even though the shock will comply and allow some ski lift, its nearly impossible to re-entry or bring the sled all the way over with ARC engaged. Another important thing to understand is that ARC is a shock and has a spring rate with valving, so the harder and faster you hit the shock the more it will stiffen. A stiffer shock might give you a more feel-able change in the garage and in a climb but most of the time it could inhibit the actual performance of the rear suspension. As time goes on we will continue to develop and design new configurations in order to improve the performance but what your dealing with is most likely a technical problem with how the shock is functioning. But I can tell you how awesome it all is but if the shock is not functioning in your skid than it doesn’t matter. There is a specific way to test the function of ARC to see if its working, you’ll need to do this so that we can figure out why your not feeling the results. If your sled is sitting flat on the ground and you or any one else gets on the sled, you are compressing both the center shock and the rear shock at the same time. In other words you are already coupling, so engaging ARC wont show any difference. You have to isolate the rear shock as if the skis are lifted. First make sure that if your naturally aspirated you have 50 psi in the ARC shock and if your running boost then use 100 psi. Then place the skis on blocks and use a similar height block directly underneath the rear scissor (not the shock). This simulates an isolated load on the rear shock which is what ARC will assist. Press down on the rear a few time and then engage ARC. You should feel a noticeable change in the rear when its engaged, if not then the shock is not making it into its stiffest position. This is usually caused by play or stretch in the cable, which can easily be remedied by adjusting the cable tensioner on the lever. If the cable is very tight, you still need to adjust the cable tensioner out 1/8” to compensate for cable stretch (see instructions). We have had sleds out of adjustment that sound like what you are dealing with, and there is not a feel-able change from one position to the next. Ive been riding a Ski-doo XM for two seasons with ARC and I wont ride in any technical terrain without it. Ive tested with Chris Burandt, Dan Adams, Chris Brown and more, in side by side climbing situations. The results are very conclusive and so Im convinced that if ARC is working properly it should be noticeable to you. Q: "I just installed the 3 position ARC on a Polaris 850. The sled is stock. What air pressure do you advise in the shock? I had heard that the pressure should be at 0 on this chassis, so I set the pressure at 0, blocked up the suspension under the rear scissor, and there was a difference in stiffness between the handlebar lever being all the way out and all the way in, but I was surprised how readily the ARC shock did move even at the stiffest setting. Does it need more pressure?" A: "Pressures depend on the setup and in your case I would run more air. Here are some things to consider. -The adjustment at the lever is not affected by the air pressure at all, they are separate functions inside the shock. It will only adjust the "recovery" rate and add a ride height control to the rear suspension setup. The factory coil over spring can fatigue rather quick and so more air pressure can help. -Front suspension setup can affect the air pressure you use on ARC. Factory ride height on a 2019 is lower than we run on many of our geometry modified front suspensions so you can get away with more pressure without getting too much ski pressure. I would start at 30 psi, it will make it feel more responsive. If you like the feel then try 50 psi, and then try 15 psi. 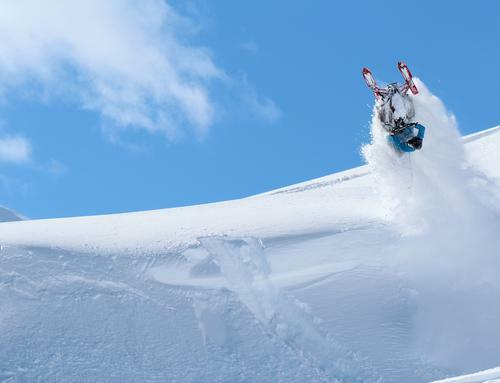 Snow conditions can change the feel of the sled and so keep in mind that you might run different pressures at different points of the season. -Because ARC is an actual shock, the stiffest position will increase in resistance with shaft speed. Just like you can push through the travel on your ski shocks with ease at slower speeds, you can push through ARC. But at the speed the suspension travels at while in motion everything changes, ARC becomes very dynamic. It gets stiff enough to bend parts like the scissor if not made strong enough. This is what makes ARC so effective. It doesn't "shock" the suspension like other coupling designs, it works with the independent motion of the skid, always apply tension to the scissor and keeping the front down. But it never makes the sled feel uncompliant or stiff, because it will have that small amount of give. We talk about the locked out position but it doesn't ever lock out completely." Q: "I am wondering if you can tell me what size of tubing that your footlok traction cleats will fit? I have custom built running boards on my sled and would love to use the cleats." A: They were designed to fit a 5/8” tube, but the cleats will work on larger tubes as well. We have used them on tubes up to 1”. Is there a reason why the Rasmussen one isn’t compatible with a float plate? Does is protect everything that the skid plate protects. Just wondering why they would have made one that isn’t compatible with any skid plates." A: "When we built our Rasmussen bumper for the 850, the way that the nose and underside of the machine is formed and constructed doesn't permit a feasible way to manufacture a bumper with down tube or nose cone protection and provide the necessary gap for the skid or float plate. In addition to this, the Ski Doo skid plate takes a different form than we wanted when building our bumper and our Float Plate is a different shape and we run a thicker, tougher plastic than Ski Doo. With all of these issue colliding, we decided the best way to run a skid or Float Plate would be to use our standard front bumper (SDFB450) and typically anyone that wants the Rasmussen bumper (SDFB450-BR) would just use that for front/lower protection." "It seems like it would be easy but it's actually fairly complicated."